Joe Hutsko is a technology enthusiast, a journalist, an author, and a consultant. He contributes to the New York Times blog Green Inc., and has covered the latest tech trends for Fortune, MSNBC.com, Wired, the Washington Post, Newsweek, Time, Macworld, PC World, TV Guide, and others. He runs the green gadget blog gGadget.org and his personal Web site, JOEyGADGET.com. Part I: Settling into a Green Gadget Mindset. Chapter 1: Mother Nature’s Green-Eyed View of Gadgets. Chapter 2: Practicing Green Gadget Living. Part II: Getting Green with Gadgets You Own. Chapter 3: Saving Money (and the Planet) with Rechargeable Batteries. Chapter 4: Maximizing Energy Savings for Your Portable Gadgets. Chapter 5: Energy Savings All Around the House. Part III: Minimizing Your Computer’s Carbon Footprint. Chapter 6: Your Computer’s Energy Use. Chapter 7: Reducing Energy Consumption in Windows. Chapter 8: Conserving Power with Your Mac’s Energy-Saver Settings. Part IV: Acquiring Green Gadgets and Gear. Chapter 9: Knowing the Difference Between Truly Green and Greenwash Hype. Chapter 10: Choosing Green Mac and Windows Computers. Chapter 11: Buying Green Mobile Phones and Handheld Gadgets. Chapter 12: Getting Green Gadgets for on the Go. Chapter 13: Adding Green Gadgets around the House. Part V: Ridding Yourself of Gadgets the Green Way. Chapter 14: Donating, Gifting, and Selling Unwanted Gadgets. Chapter 15: Erasing Your Personal Information before Getting Rid of Gadgets. Chapter 16: Recycling and Properly Disposing of Hopelessly Useless Gadgets. Chapter 17: Ten Cool Green PC Peripherals and Accessories. Chapter 18: Ten Green Gadget Designs. Chapter 19: Ten Green Gadget Buying Tips. 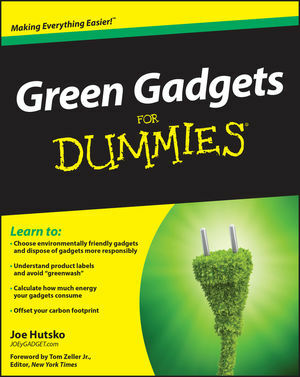 Chapter 20: Ten Frequently Asked Questions about Green Gadgets.